What does Hollywood have against Kate McKinnon? It’s a question I’ve been asking for a while now as the funniest current Saturday Night Live cast member continually gets stuck in middling-to-insufferable comedies on the big screen. Remember the awful Masterminds? Or how she was one of the best parts of Ghostbusters? What about Office Christmas Party? Rough Night? Does her agent have a secret grudge against her? Did McKinnon get hexed by an evil casting curse (maybe it was those aliens)? Does Hollywood just not know what to do with a woman as comedically weird as this SNL star? 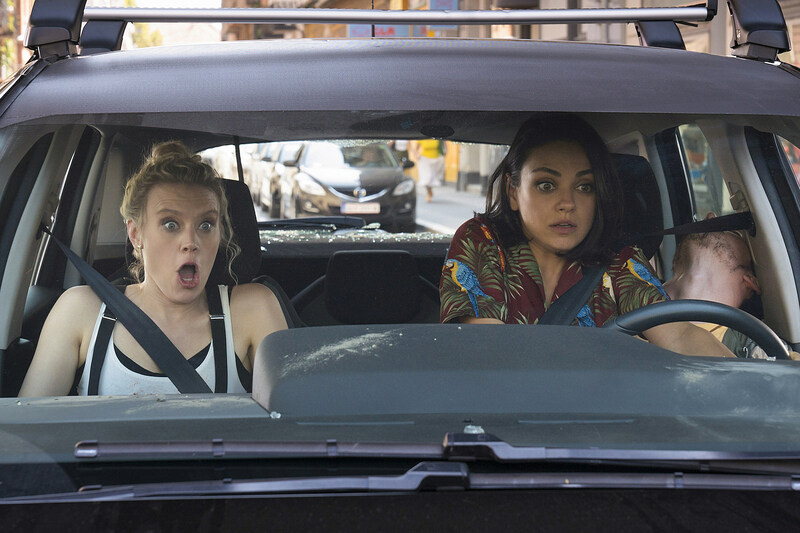 After watching McKinnon attempt to single-handedly salvage another disappointing comedy in this week’s The Spy Who Dumped Me, I still have no answers. What I do know is even when McKinnon gets handed the weakest of scripts and thinnest of characters, she still finds a way to become the film’s most enjoyable element. If anyone can make a bad buddy comedy just barely watchable, it’s McKinnon. In the spy farce from director Susanna Fogel (Life Partners), McKinnon plays goofball Morgan Freeman — yes, that’s her character’s actual name and the movie squanders the single joke about it. Morgan’s a struggling actress and eccentric best friend to Audrey, played by a fine Mila Kunis who’s consistently overshadowed by her co-star. I can tell you the plot, but it’s pretty neatly summed up by the title: Audrey gets dumped via text by her boyfriend Drew (Justin Theroux), who’s a secret agent. Then he dies, so she and her bestie set off to Europe to complete his mission. A bunch of witless nonsense ensues from there. There’s a Vienna cafe shootout where a bad guy gets killed with a steaming pot of fondue, a car chase with a dead Uber driver, a torture sequence with a model-turned-assassin-turned-gymnast, Audrey cutting off a man’s thumb to unlock his phone, and an ambush that ends with a close-up of a Ukrainian hitman’s junk. It’s all painfully unfunny and shockingly violent, with grisly set pieces that look like they were ripped from a schlocky, ultra-serious action flick. And is it just because I’ve seen Mission: Impossible – Fallout twice already, or do most of The Spy Who Dumped Me’s action sequences look like cheap rip-offs of the M:I franchise’s set pieces? Even Sam Heughan’s (Outlander) British agent is like a less-charming imitation of Henry Cavill’s August Walker. Sure, this is a spy parody so similarities abound, but Fogel’s film, which she co-wrote with David Iserson (SNL, Mad Men, New Girl), can’t manage to bring anything surprising or humorous to the genre it’s riffing. Instead, it’s a messy and tiresome clash of recycled clichés. While the title is an obvious spoof of the Roger Moore Bond film, I’ve been accidentally calling it The Spy Who Shagged Me for weeks now. I only wish this could’ve been as kooky and playfully dumb as the Austin Powers movies. But thank God for McKinnon, right? Early on, the douchey Drew insults her Morgan for being “too much.” Sorry, Justin Theroux, but McKinnon’s too-muchness is the only thing The Spy Who Dumped Me has going for it. She brings an energized gusto to even the most deflated lines and sequences, and while I can’t pretend she saves the whole thing, she does give the movie its few laugh-out-loud moments. Morgan has an A-plus Cheesecake Factory joke I was still laughing over moments later, a series of TMI phone calls to her parents (played by Jane Curtin and Paul Reiser) about analyzing d—k pics, and an affectionate freakout over Gillian Anderson’s CIA boss — extra enjoyable considering McKinnon’s real-life obsession with the actress. She even lends some playfulness to the film’s attempts to get poignant about female friendship, where Morgan pesters Audrey to be proud of herself (for killing a bad guy). Then the final set piece, a goofy Cirque du Soleil-esque trapeze showdown between Morgan and the model/assassin, plays like something right out of an SNL skit. Perhaps therein lies the problem: all of McKinnon’s film roles are like a bunch of SNL sketches cobbled together, limiting her to goofy voices, exaggerated guffawing and crude one-liners. Don’t get me wrong, I thoroughly enjoy watching her do whatever it takes to entertain us. But why can’t McKinnon land parts where her comedic abilities contribute to an actual character arc, and within a smart, or even half-way clever narrative?